Ride seasonal sales to a profit with precisely targeted Snowman Kit Seasonal Merchandising as a shopper lure. Nothing could be timed better, and few Winter items would have the impulse purchase impact of this item. Look close to see that Kit materials include hat, plastic coal for eyes and mouth, carrot for nose, large buttons and scarf as finishing touch. 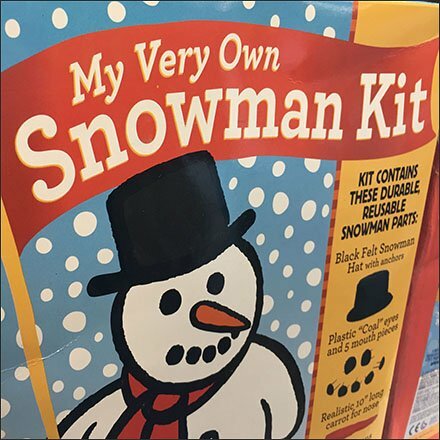 To protect from lawsuits, the box also warns “All you need is snow.” Oddly enough, or possibly not odd at all, is that this Snowman Kit Seasonal Merchandising was seen at JoAnn Fabric and Crafts.